A few months ago Graeme and I set out for a drive down the 401 eastbound towards Campbellford. We were heading to a wedding -Kirsty and Kevin were getting married! I giggled and told Graeme that Cosway forgot his shoes. We both agreed we could afford to stop. I text: We are about a 10 minutes out. We can stop in. How do we get into the house? Katie: I am going to call Cos’ mom and see if she can run over with a key. Me: Ok. Let us know. Graeme and I continued to enjoy our sunny drive out of the city when Graeme turned to me and said, “I forgot my shoes and my belt.”Wha! I looked over at the driver side to see what shoes Graeme was wearing. He was sporting his fish shoes. What are fish shoes you may ask? Graeme’s fish shoes are canvas slip ons that are patterned with carp. Oh dear. Me: Katie! Graeme forgot his shoes too! Ha ha ha! Katie texts: No luck on getting a key to the house to you. Carry on. We are almost in Campbellford. Going to check out Stedman’s for a pair of shoes. Should I look for a pair for Graeme? Now, if you are at all aware of small town Ontario stores, you may have come across a Stedman’s in your life. They are run down catch all stores that sell everything and nothing. It’s a place where you can buy a copy of Black Knight for $29.99. I didn’t have high hopes. Katie texts again: and the other pair is $9.99. Between texts, I had a small glimmer of hope that maybe, just maybe, there is a possible decent pair Graeme could get without breaking the bank. But, the mere fact that they were $9.99 meant something … not good. Me: No to the $49.99. Graeme doesn’t want to spend $50 on a pair of emergency shoes. What’s with the $9.99 pair? 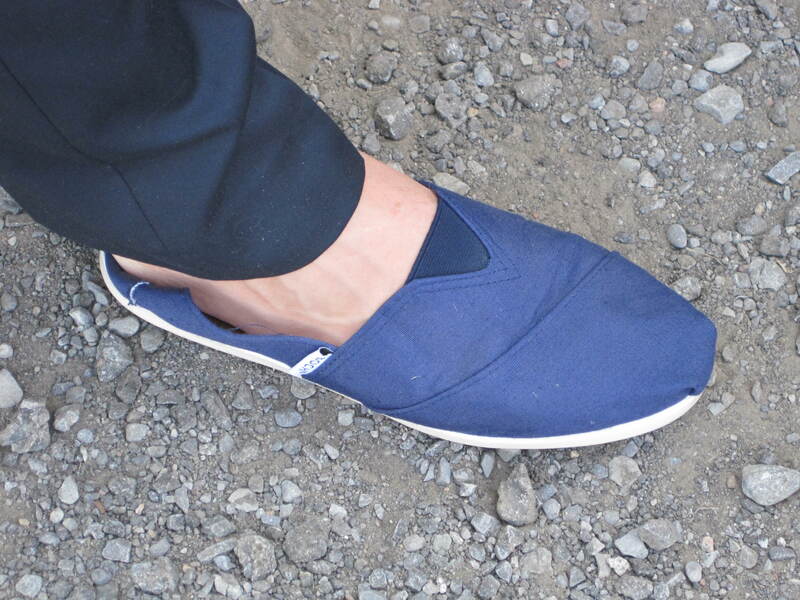 Kate: They are knock off Toms. They’re called Bobs. Cosway’s going to get them. Graeme seemed non-plus about his shoe situation (he doesn’t ruffle easily). We rolled into town and met up with Graeme’s parents. He mentioned he forgot his shoes. “No problem,” Pa Brown declares. “I have an extra pair!” We took them, Graeme knowing full well that his feet are a whole one and half sizes larger than his dad’s. He decided to squeeze into them for the sake of showing up all gussied up for the ceremony with his sharp suit. After the ceremony is over, we ran into Katie and Cosway. He’s got his Bobs on. He showed them to me, and really from the front they look alright. Almost acceptable. I mean, if we were at a destination wedding and he was wearing these to walk on the beach, they would be a-ok. Then, he turns them around to show me the back end of the shoes. By the end of the night, both men who crammed their feet into shoes too small, were wearing flip flops and fish slip ons again. They should have just gone with their original footwear. It would have been far more convenient. But, I’m glad they didn’t. Every time I think of this incident, it still incites the giggles. Hilarious! You can’t make this story up! I want a pair of fish loafers…for work! Haha! They make excellent conversation starters!